101,252,037 B.C. - 70,611,152 B.C. 70,611,152 B.C. - 41,302,480 B.C. The axis of aggregate matter was displaced eighteen degrees from the normal established on the first day, thereby causing great and widespread disaster. The indication is given in the Melchizedician chart (see Mos. Sys. and Macrocosmic Cross) that Lucifer, the angel Death, was created on the second creative day, and, further, that the disaster of the second day was caused by Satan, Prince of Evil. 41,302,480 B.C. - 33,407,206 B.C. 33,407,206 B.C. - 23,383,718 B.C. The Word of God made his advent as the Sun of Righteousness on the fourth Creative Day. Mazzaroth (Cassiopeia) is identified with the catastrophe of the 4th creative day. This event lead to the supersedure of the sun of the physical world by Messiah as the Sun of Righteousness. Consequently, this link in the life of Christ also becomes identified with the Messianic Triangle, and, hence, with the Great Pyramid. 23,383,718 B.C. - 10,661,595 B.C. 10,661,595 B.C. - 3897 B.C. The collision of two planets, Jupiter and Asteroid; this destructive war in heaven between the Archangel Michael and Satan in the beginning of the Euphratic age; the war being the passing of a red comet. "The scientist Bode entertained the opinion that the planetary distances above Mercury formed a geometrical series, . . . but this law seemed to be interrupted between Mars and Jupiter. Hence he inferred that there was a planet wanting in the interval; which is now supplied by the discovery of the numerous star-form planets occupying the very place of the unexplained vacancy. . . . Many eminent astronomers are of the opinion that these telescopic planets are the fragments of a large celestial body which once revolved between Mars and Jupiter, and which burst asunder by some tremendous convulsion. . . . From this discovery. Dr. Olbers first conceived the idea that these bodies might be the fragments of a former world. "It is the opinion of many that the planetoids (asteroids) are the fragments of a planet which has been destroyed. The idea has been advanced that this planet was the seat of a fallen race, and that the 'powers and principalities of the air,' against which the people of this earth have to contend, are in reality the lost souls of the planet in question." . . . [Sir W. Thomson and Prof. Helmholtz agree in suggesting the meteoric hypothesis as a possible way of accounting for the origin of terrestrial life, its germs having been wafted to us from some other world or its fragments. See pp. 102-103.] Many supposed mythological traditions of ancient Greece have been shown to have a foundation in history; and we may assume that this is possibly the case to a far greater extent than has yet been proven, and that it applies to other localities and peoples as well. Isaiah makes reference to Lucifer as having falling from his shining place in the heavens, and intimates that its people were not suffered to rest even in their graves (Isaiah, xiv., I2-l6, 19). This would be literally true if the planet had been destroyed. We have to confront numerous traditions regarding the fallen race,—tempters of Adam and Eve, etc. The Talmud speaks of the ancient people of earth as having faces that shone like the sun, and natures that reached into the heavens. The 'morning star' has vanished, and where once was unity, light, and power, we now have but a confused mass of planetoids moving in eccentric orbits. The extremity of individualism stands exemplified, and the mind and nature of humanity is broken and divided in like manner, for this was not merely the experience of a planet, but a tragedy of the solar system, the effect of which is spread over thousands of years, though it is probable that we are now well advanced in the restoration of order. . . . Will this lost star be re-lit in the material heavens? We judge not. 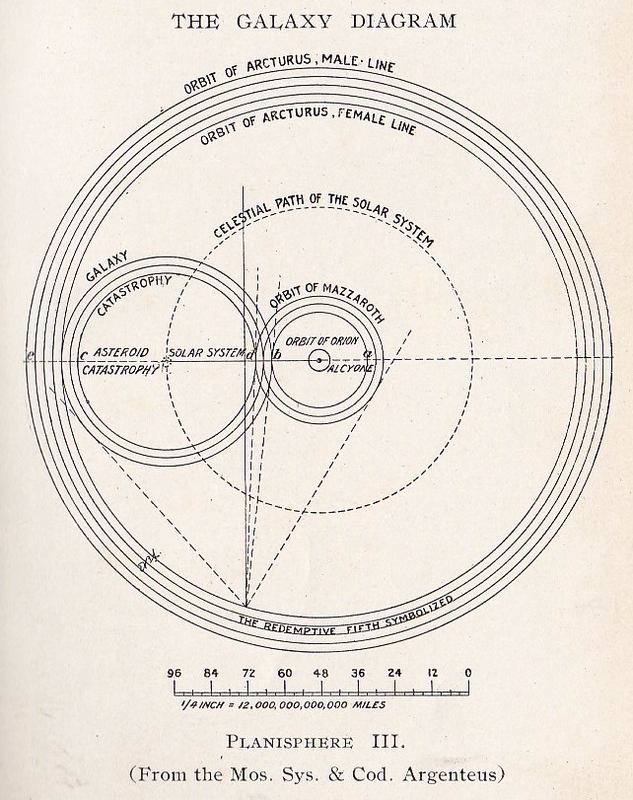 The solar system has established a new equilibrium. . . . Was this calamity unforeseen? We judge not. Man's extremity is said to be God's opportunity; and from that period dates a new cycle of this solar system. Neither this earth, nor yet the solar system, are complete in themselves, but are merely parts, physically and spiritually, of one perfect whole. Satan cast out and into earth.